Streaming options for television and film have accelerated from the television screen to people’s smartphones and tablets. Suddenly, every corporation wants to reach the same level as streaming services like Netflix. Many big players such as investors in Hollywood and Silicon Valley are competing to sell people more entertainment over the internet as corporations will try to produce more films in the year 2019. This is only the beginning of the streaming revolution since Americans can now choose between Youtube, Amazon Prime, HBO, Hulu, Showtime, and many more. As a result, this has become a multibillion dollar war for your attention and will continue to be so until someone ends up winning. Social networks such as Twitter, Snapchat, and Facebook are investing more into videos, and are already streaming some television shows. Therefore, the old-line studio of Hollywood will unfortunately lose pay-TV subscribers in America. Most viewers are switching from expensive bundles of channels to online videos. Hence, the competition has, rather dramatically, become a battle for survival over the different streaming options. “How many of these will people pay for?” asks Landgraf, who coined the term ‘peak TV,’ which is the new service that many people will start using. He worries that at some point there will be too many streaming services that will cause a great shakeout. 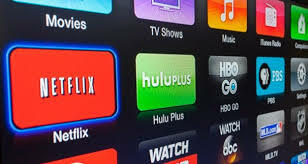 Nonetheless, the tech giants like Netflix and Amazon have a head start in streaming customers with deep pockets since these two are loaded with revenue and the studios will struggle to catch up to the level that they are currently in. Landgraf sees this as ironic because studios and networks like these have helped make Netflix a giant by selling it their best TV shows and films. It is funny to see that these other studios and networks are trying to make a name for themselves while they are giving their best shows to another streaming service.